Boko Haram is the militant Islamist sect responsible for the death of at least 800 individuals in northern Nigeria during a series of attacks in late July. It's attack began in Bauchi State and soon spread violence across other predominantly Muslim states, forcing 4000 to flee their homes, according to officials. In addition to the deaths, businesses, homes and churches were burnt in the process. Its leader, Mohammed Yusuf, was apparently killed in custody by officials, despite initial assertions to the contrary, and in the aftermath of the violence which spanned several states, there remain many unanswered questions. Mohammed Yusuf was captured and interviewed by Nigerian police. In a video showing part/all of his interrogation, the videographer and most of those present in the room were asked to leave. Despite the police's claim that he was killed in combat, it seems that not too long after that interview, Yusuf was killed while in police custody. *video is predominantly in Hausa. President Yar'Adua has now ordered an investigation into Yusuf's death. However, there is growing evidence that Yar'Adua previously knew about Boko Haram and likely, the sect's violent intent. According to NEXT, Nigeria's State Security Service (SSS), which reports directly to Yar'Adua and has previously arrested and held bloggers illegally, provided reports on the activities of the radical religious sect. Hence, there is reason to believe that the loss of life, destruction to chaos and the sense of security, could have been prevented. This possibility calls into question the President's sincerity with this newly announced investigation into Yusuf's death. That, plus the fact that Nigeria has an unfortunate history of extrajudicial killing such as the little spoken of Odi massacre in 1999 and the yet to be solved murder of the Apo 6 in 2005, suggests that like other instances, nothing will happen as a result of this investigation. After all, no Nigerian is yet to be tried for their involvement in the Halliburton bribery case or other instances of wrongdoing, highlighting Nigeria's punishment problem. But, if indeed it is proven that there was an extrajudicial killing involved in the death of Mohammed Yusuf, it will be crucial to investigate and enforce already existing laws preventing and punishing such actions. Yusuf, alive, could have been useful in investigating Boko Haram and determining who was funding the sect with the money and weapons needed to create the carnage it did. In order to prevent a repeat of the radical Islamist teachings that led to Boko Haram's existence, Nigerian clerics and a coalition of northern governors decided to require a council to regulate the activities of preachers in the north. "Many people have known of the existence of this group, silently and within the community, especially in the last year... [t]hey are becoming more extreme because in the past there wasn't a major push in place to check their proliferation." "They are taking advantage of a broken-down structural condition in Nigeria that people can take the law into their hands without getting reprimanded." Nevertheless, a commitment to prevent a repeat of this violence is better than none at all. But, what remains to be seen is whether, once again, the laws will actually be applied and whether or not the mere regulation of who can preach in the north is enough to keep a similarly-leaning group of well armed religious fanatics to carry out a similar operation. It would have been preferable if this council intended to reveal the names of those who financed Boko Haram, names that are undoubtedly already known. WAS THIS MERELY A COINCIDENCE? It seems that whenever a major international event is coming to Nigeria, religious violence breaks out in certain parts of northern Nigeria. Right before Nigeria was to host the Ms. World competition in 2002, violence broke out in parts of northern Nigeria. In response to the security concerns, the competition was hurriedly moved to the United Kingdom. This year, Nigeria aims to host the FIFA Under 17 World championships in October, and the recent violence sparked by Boko Haram means that certain affected states, such as Bauchi will likely not host games in the tournament. There are those that are very content to hold the north back in terms of economic development. By ensuring that the region is a hot spot for religious fighting, investment is guaranteed to stay away, depriving the region and the nation of the opportunity to improve conditions. Such concerted efforts by certain interests to take advantage of situations that will propel Nigeria on an international stage must be prevented. Particularly, as the nation has publicly pledged to 'rebrand' itself and become a top 20 economy by 2020. Ultimately steps must be taken to prevent other radical Islamist groups from disturbing the peace in any part of the country. This not the first time that a religious sect has caused chaos, but this is definitely an opportunity to ensure that there are little to no repeats. Hattip to Webround for sending in the video. Please read Imnakoya's 'Islamic sect leader killed in custody: Two wrongs do not make it right'. we will never know what happened. boko haram started in 1995. a movement against western influence which was percieved by them to be a corrupting force that resulted in poverty and injustice. for me these executions were a cover up. not just yusuf. all the top command has been quietly executed within days. Also the ferociousness with which the state cracked down leaves the highest death toll in the shortest time ever. not even odi, gbaramatu comibined come any where close to this body count. i here it was like baghdad. There was much to hide. it seems that whenever a major international event is coming to Nigeria, religious violence breaks out in certain parts of northern Nigeria so that, by definition, North Nigeria is a no-go for international events! English Language transcript via nexT123, here. @ Pam: There is definitely something to hide as you so clearly note. This Boko Haram problem is one that has been around for years. Now, all of a sudden they kill everyone involved with little time for an investigation so as to understand who, what, when ,where, and how to prevent similar future occurrences? Definitely something fishy going on. I wonder who is being protected? Is it just armed officials who apparently shot first without distinguishing between innocents and radical Islamists? Is it just the federal government and particularly Yar'Adua who allegedly knew of Boko Haram but did little to prevent their actions? Is it the rich patron(s) in our outside Nigeria who feels it is his/her duty to support militancy with their money and thus fund such sects? The answers are countless, on my part. Thanks so much for visiting! Don't be a stranger. @ Beauty: my goodness...thanks for the link. Was looking for a Hausa speaker last night on Twitter but Nigerians were asleep. Will have to read the transcript closely. It is clear, at least to me, that there are those that are very content to hold the north back in terms of economic development. By ensuring that the region is a hot spot for religious fighting, investment is guaranteed to stay away. What a shame that we the people do not see this for what it is - an effort at control. Thanks for swinging by. Thanks for the plug to Grandiose Parlor. 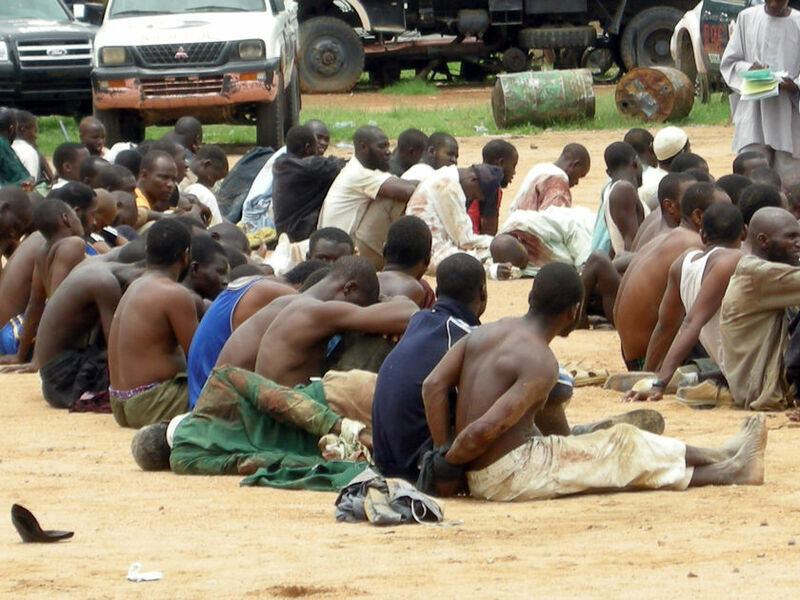 The Boko Horam uprising is not the typical Islamist radical vs. Christian duel. The attack was focused more on the state, the police, and the way of life in the north that they found contradictory to the Sharia. They wanted to change the 'system'. This is treason, the first of its kind in recent time. It worries me. It is worrisome that the security apparatus fell asleep and not proactive. It is worrisome that an alleged financier, a former commissioner in Borno state, was executed in the same manner Mohammed Yusuf was, by the police. What is also worrisome is the fact that indiscriminate police actions have made the Nigerian army look like 'saints' in their handling of the crisis. Boko Haram + Niger Delta + increasing armed robbery + stalled economy + clogged bureaucracy driven by bloated and impotent political structure, and you get a picture of an emerging failed state. Under this kind of situation, anything can happen. I hope I'm wrong and just over reacting. I hope at the end, the obvious calamity that has been starring Nigeria in the eye will make a miracle u-turn, and all will become well. I really hope so. o, i didnt even notice, how did u get so many readers?, let me follow ur blog.